U.S. customs officials arrested a 32-year old woman aboard a cruise ship when it docked in Miami, Florida on June 20, 2004. She spent the next 9 hours in handcuffs and leg irons. 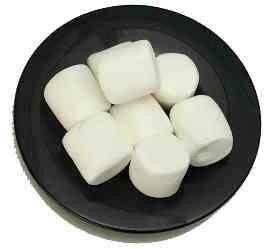 Her crime: Failing to secure marshmallows from hungry animals during a trip to Yellowstone National Park. It turned out that the woman had already paid the $50 fine, but the Park Service "snack police" forgot to record her payment and so erroneously placed her name on a federal database of people with outstanding arrest warrants. The story below appeared on the AP (Associated Press) news wire on June 21, 2004. A teacher's aide who forgot to put away her marshmallows at Yellowstone National Park last year was taken from her cruise ship cabin in handcuffs and hauled before a Miami judge Friday, accused of failing to pay the year-old fine. Hope Clarke, 32, crying and in leg shackles, told the judge she was rousted at 6:30 a.m. EDT by U.S. government agents after the ship returned to Miami from Mexico. She insisted she had paid the $50 fine before she left Yellowstone, which has strict rules about food storage to prevent wildlife from eating human food. Customs agents meet all cruise ships arriving from foreign ports and run random checks of passenger lists and a warrant claiming Clarke had not paid the fine was found in the federal law-enforcement database. Assistant U.S. attorney Peter Outerbridge conceded there were some "discrepancies"; but suggested to the judge that Clarke appear in court again to clear up the warrant. U.S. Magistrate Judge John O'Sullivan, who had a copy of a citation indicating the fine had been paid, apologized to Clarke, who spent nearly nine hours in detention and demanded the U.S. attorney's office determine what went wrong. Zach Mann, spokesman for U.S. Immigration and Customs Enforcement, called the arrest "an unfortunate set of circumstances." He added: "We were acting on what we believed was accurate information."